Two very meaningful team competitions occur within the Marine Corps Marathon. Both include members of the military running on behalf of their branch of service in competition with each other, as well as against those serving in the British Royal Navy/Royal Marines. These competitions date back decades and culminate annually at 12:45 p.m. on the awards platform adjacent to the MCM finish line when the Armed Forces Marathon Championship and Challenge Cup are presented. Each year, military members from the United States compete in the Armed Forces Marathon Championship -- a competition between elite running teams of the U.S. Army, Navy, Air Force and Marine Corps. The services compete for bragging rights and the winning title as the fastest branch of the Armed Forces. Winning teams include two categories; men's and women's divisions. The winning men’s team is determined by the combined time of the top four male finish times. The women’s winning team is determined by the combined top two female finish times. Both the U.S. Army men’s and women’s teams dominated the Armed Forces Challenge at the 41stMCM on Oct. 30. 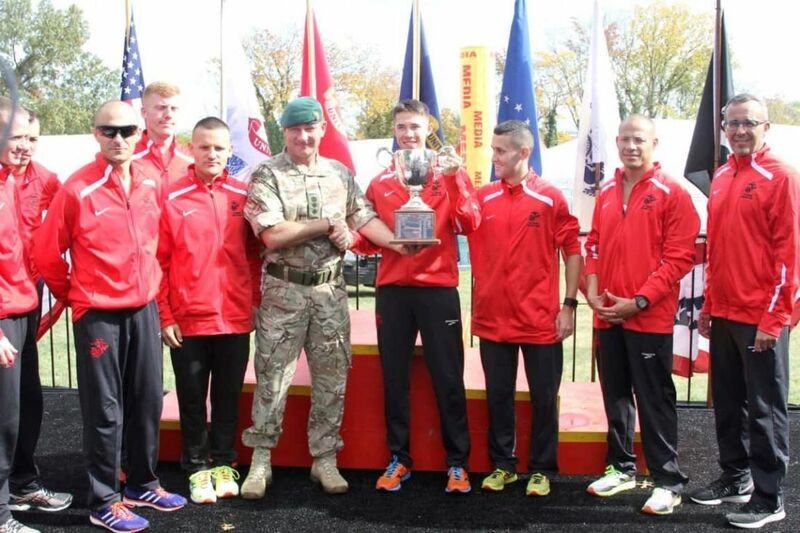 The Army men’s team was led by overall MCM winner Spc. Samuel Kosgei, who finished the marathon course in 2:23:53. The Army men’s team averaged a 2:29:51 finish and won the Armed Forces Competition with a combined 9:59:23. This resulted in a victory over the second-place U.S. Air Force team that averaged 2:41:15 (10:45:00 combined). The Airmen were followed by the Marine Corps and Navy men’s running teams, which took third and fourth place respectively. The Army women's team finished in first place with Capt. Megan Curran the overall winner with a marathon finish of 2:53:19. The Army women ran the MCM course with an average finish of 2:59:53 and a combined win of 5:59:46. The U.S. Marine women’s team took second place with an average finish of 3:08:49 and a combined time of 6:17:37. The 2016 Air Force women’s team only included two runners with their team capturing third place and the U.S. Navy women’s team placed fourth. Since 1978, military runners serving with the British Royal Navy/Royal Marines travel thousands of miles to compete against the United States Marine Corps running team in the annual Challenge Cup Competition. The winner is determined in two categories in both a men's and women's division. The men’s team winner is determined by the combined time of the top three male finish times. The winning women’s team is determined by the combined time of the top two female finish times. Annually, the winning Challenge Cup team receives a 1897 Victorian silver trophy, once belonging to the H.M.S. Victory. In 2016, the Challenge Cup was captured by the Royal Navy/Royal Marine Team who took first place from their American counterparts. The British team finished with a combined time of 8:00:25. The U.S. Marine men’s team finished second with a combined time of 8:05:42. The Royal Navy/Royal Marines have now captured the Challenge Cup 25 times. The U.S. Marine men’s team has won the Cup 14 times. The Challenge Cup Competition between the U.S. and Royal Navy/Royal Marine Women’s Running Teams began 20 years later, in 1998. While the teams have not competed each year since consecutively, the U.S. Marine team has won 11 times, while the British women’s team has captured the Cup four times. Last October, the U.S. Marine women’s team was victorious, finishing the MCM course with a combine time of 6:17:34. The Royal Navy/Royal Marine women’s team earned second place with a combined time of 6:40:09. Beginning in 2017, the MCM will no longer issue awards in the team and weight group categories.